Audi the German car maker held the Third Edition of the Audi Twin Cup in Delhi, India. 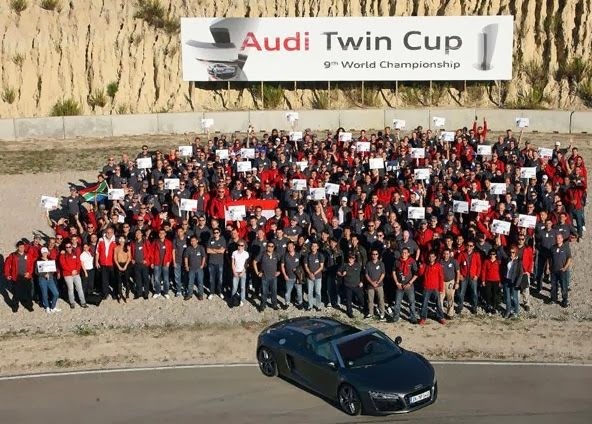 Across India six of the best technical teams and six of the best service teams from Audi dealerships has participated in the finals held for two days and competed for the championship title. Mr. Joe King, Head, Audi India, handed over the Audi Twin Cup trophy to the winning teams of ‘Audi Ludhiana’ in the Technology Category and ‘Audi Mumbai South’ in the Service category. “The Audi Twin Cup underlines our customer centric approach and our constant endeavor to enhance our unparalleled service offerings. World-class service is increasingly becoming a deciding factor for customers and is the key to our success. At Audi, we demonstrate our premium services by keeping the customer at the center of everything we do. This initiative gives our Audi partners, who are committed to providing excellent services, with an ideal platform to demonstrate their expertise and efficiency,” said Mr. Joe King, Head, Audi India. The Audi twin cup is exactly an equal test for technical knowledge and systematic customer orientation. Those who are well versed to combine both skills would have the more chances to win the service competition. In finals the competition were completely based on close and efficient cooperation between technician and service advisor- should provide all round premium services across all areas at the dealership. The task assigned to both teams was to diagnose the faults effectively in prepared vehicles, find the best solution and let the customer know with the exemplary personal skills. “Audi Mumbai South” team has demonstrated their best expertise in service and beat other teams in finals and become a winner in service category where as” Audi Ludhiana” Team performed well in Technical skills and won the technical category. “We are very pleased with the quality of technical knowledge demonstrated. Our technology and service teams scored well in an Audi AG moderated framework, which means that they were evaluated on the same level as other markets internationally. This exceptional performance in such a challenging environment is truly commendable. This initiative helped us to elevate the technicians’ importance and role in contributing to the success of Audi in India. This recognition we believe, will be one of the pillars to support our Audi partners to motivate their talented technical staff." added Mr. King.